Bureau B+B, in collaboration with Investeren in Ruimte, won the competition “Cruquius: Public space as the driving force for transformation” with its submission “Speelruimte”. 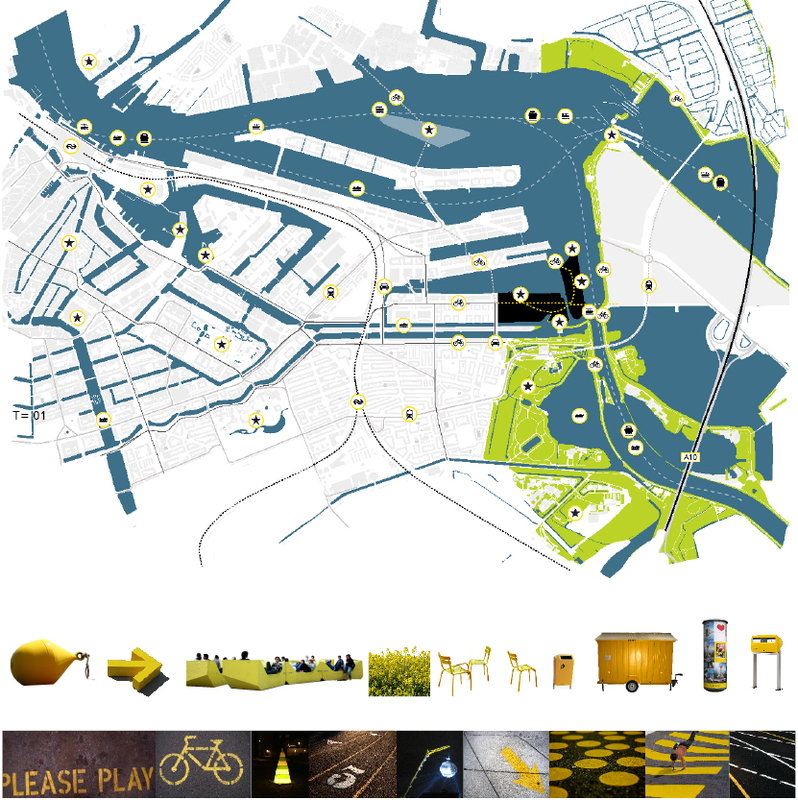 Organized by the Platform Openbare Ruimte, the competition called for innovative ideas and strategies for the redevelopment of the Cruquius peninsula in Amsterdam’s Eastern Docklands. The jury unanimously chose the “Speelruimte ” strategy from the 55 submissions entered. The plan outlines how to stimulate the transition of the outdated industrial terrain using a strong insight into the area’s essential spatial qualities. Space will be created in crucial places. The voids will be marked as extraordinary areas with the same yellow/black signage used in navigation and temporary road construction. The area is locked of by fences, walls and buildings. There is no visual connection to the water and the river banks are poorly used. The position in the city is fortunate, by connecting bike lanes and roads to Cruquius more activity will be triggered. The existing silo’s winecrates and cranes are characteristic to the site and provide diverse space for different events and activity. By making space, removing fences, demolishing buildings or painting them black, a flexible new public space is created. The black boxes become beacons in the skyline of transition. Connections to the waterside and the greater surrounding are achieved. By reshaping the Cruquiusroad, planting herbs, applying yellow signage to the surface and installing clip-on’s and plug -in’s and painting black hangars a new flexible public space created where events of different natures can be organized. Ferries to Sporenburg and Zeeburgerisland connect Cruquius to a greater degree while the the temporary use improves the identity of this area in transition.